New York, NY--Christopher Designs announces the launch of its new website, After months of consumer and technological research, followed by more months of development and testing, the new website is rich in bridal and lifestyle imagery and video and offers an elegant and consumer-friendly feel. The new single site integrates the designer’s two previous websites, which were separated into Crisscut and L’Amour Crisscut. The new single site is 100% mobile friendly, with full HD video capabilities and total social media integration. Product images are beautifully photographed and intricately explained in consumer-friendly language. 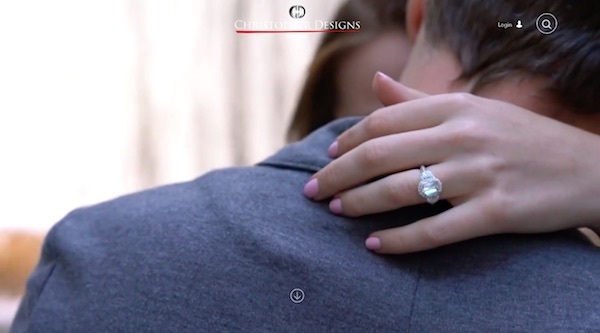 The site is targeted to consumers with the objective of driving traffic to Christopher Designs' retail jewelry store accounts. On the site, consumers have the option to add pieces to their wish lists and share pieces with friends. 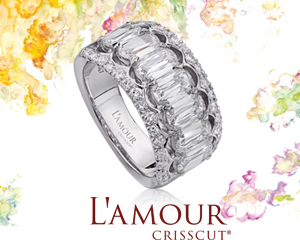 Consumers can also find out more about any design by contacting a Christopher Designs consumer specialist via telephone or email, or be directed to a fine jeweler in their area to view the piece in person. Christopher Designs' network of fine retailers is listed, complete with contact information for each, their exact location, and Google Maps directions. The new site, www.christopherdesigns.com, will be supported in the brand's advertising, PR, social media, and with both internal and external SEO efforts to generate awareness and traffic. Image from the new Christopher Designs website. 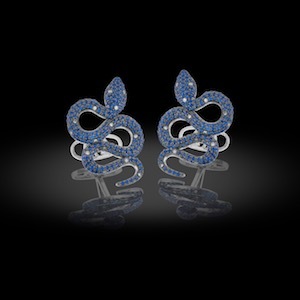 Antwerp, Belgium—David Gotlib, a third-generation diamantaire, always had a secret hankering to create a line of men’s jewelry. 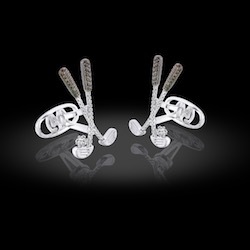 So Gotlib, the owner of IDRP, a rough and polished diamond business, assembled a team to design a range of diamond cufflinks he named “Oh My Got.” The line includes three collections: Classic (timeless styles), Smart (contemporary and thematic styles), and Dare (modern and edgy styles). 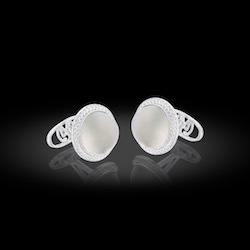 All styles include ethically sourced diamonds, ranging from white through various colors, and many styles also include ethically sourced colored gemstones. 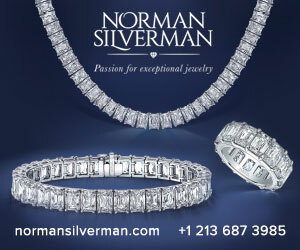 Since its inception, the line has garnered an impressive following in the fashion press and among celebrities. Carey Hart, husband of famed singer P!nk, was spotted wearing them at the 2017 MTV Music Awards, and Ron Cephas Jones, Jimmy O. Yang, and Chris Sullivan wore them for the 69th Annual Emmy Awards in Los Angeles, CA last September. Clockwise from left: Moonstone and diamond links from Oh My Got's Classic line, $4,000; golf clubs from the Smart line, $2,600; "Vipers" diamond and sapphire links, from the Dare line, $7,700. New York, NY—A Hispanic female suspect (pictured below in surveillance photos from three different targets) was on a crime spree in two states just before Christmas and remains on the loose. A Jewelers Security Alliance bulletin issued Decmeber 21 says the suspect entered a retail jewelry store in Manhattan on Tuesday, December 19, at 4:05 p.m. and asked to see a high-end gold watch. When presented with the watch, she got up and ran out of the store with it. A guard chased her outside and got the watch back, but in the process the suspect was able to flee the scene. The following day, the same suspect dressed in some of the same clothing, entered a jewelry store in Richmond, VA. She looked at the high-end watch case but decided to make a quick exit. Later in the day, however, the same suspect robbed a Richmond bank at gunpoint, by handing the teller a note and displaying the handgun in her jacket pocket. The suspect is described as in her 20s, 5’4” to 5’6” with a thin build. 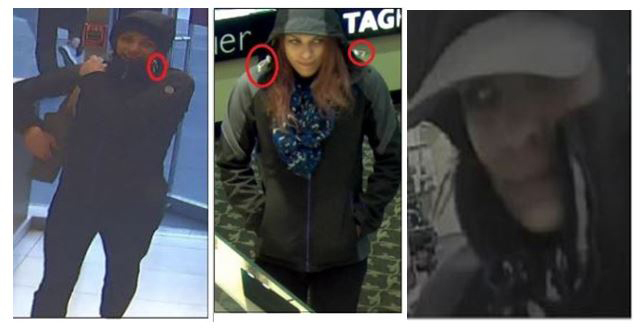 JSA photos below, from surveillance videos, highlight similarities in the clothing she wore for all three incidents. Anyone with information is asked to please call the Richmond FBI office at (804) 261-1044. Although females may be part of a crime operation, it’s more typical for their role to be as a distraction or getaway driver. It’s very rare for an armed woman to rob a store on her own. The first such criminal, Abigail Lee Kemp, went on a lengthy spree in the South in 2015 and early 2016, before being caught in Atlanta in January last year.